The Epson WorkForce WF-2630 All-in-One Inkjet Printer can perform print, scan, copy, and fax operations. This printer works well with the multiple media options. It produces highly detailed prints with the maximum resolution of 5760 x 1440 dpi. It allows fast printing with speed of 9 ppm in black or 4.7 ppm in color which save lot of time during printing. One can easily create borderless photos at sizes up to 8.5 x 11". With the W-Fi and Wi-Fi direct, one can ensure hassle-free connectivity. Moreover, the printer offers multiple printing options including, Epson Email Print, Epson Connect, Epson Remote Print, Epson iPrint Mobile App, Apple AirPrint, and Google Cloud Print. The printer uses Epson fast drying DURABrite Ultra Ink for professional-quality business documents. This cost-effective printer uses 4 individual Epson Workforce WF-2630WF ink cartridges, hence one has to replace only the expended ink cartridge. Also, the printer is ENERGY STAR certified, it consumes less power and yields better output. Home office users should not look further than this compact 4-in-1 inkjet printer for an affordable way to experience the benefits of Workforce WF-2630WF printer. The printer uses best quality Epson Workforce WF-2630WF ink cartridges and provides water-resistant, smudge-free output. Along with this, the printer offers high printing and scanning resolution. The printer has a touchscreen LED display for easy Wi-Fi setup and trouble-free navigation. 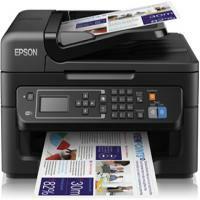 The Epson WF-2630WF is a small and compact printer with multiple features. How to remove old and install the new ink cartridges in a printer? Most of the print related issues can be solved by timely replacing the old cartridges and installing the new ones. So make sure that you have your replacement cartridges handy before you begin. Caution: Must leave your old Epson Workforce WF-2630WF ink cartridges in the printer until ready to replace them with the new ones. This is done in order to prevent the print head nozzles from drying out. If an ink cartridge is expended, you will see a message on the LCD screen. Note which cartridges need to be replaced and then press the OK button to carry out with the replacement procedure. If you are replacing a cartridge before you see a message on the LCD screen, press the up or down arrow button to choose the setup option and then press the OK button. Then click on the Maintenance tab and ink cartridge replacement option and press one of the start buttons. 2. Lift up the scanner unit and make sure to not move the print head by hand, otherwise, you may damage your product. 3. Squeeze the tab on the cartridge and lift the cartridge straightup to remove it. Note: Dispose of the used cartridges carefully in the package new ones came in. Do not try to refill the used cartridges. If ink gets into your eyes, wash them off immediately with cold water. 4. Before opening the new Epson Workforce WF-2630WF ink cartridge package, shake it well four to five times. 5. Remove the cartridge from its package. Install the new one immediately after removing the old, if you do not do that, the print head may dry out and you will be unable to print. 7. Insert the new Epson Workforce WF-2630WF ink cartridges at the correct position into the cartridge holder and push it firmly until it clicks into place. 8. Lower the scanner unit and press one of the start buttons. The print head will move to its home position and the printer starts charging the ink. A confirmation message on the screen will be seen when ink charging is finished. Q. My printer usage is very heavy. Do you provide multipacks of all colours for Epson Workforce WF-2630WF ink cartridges on your website? A. Yes, we provide multipacks of 20, 12, 8 and 4 for Epson Workforce WF-2630WF ink cartridges. Q. What are the dimensions and weight of the Epson Workforce WF-2630WF printer? A. The dimensions of the Epson Workforce WF-2630WF printer are:- 15.4 in (Width) x 21.3 in (Depth) x 11.5 in (Height). It weighs around 5.8 kg. Q. What is the printing speed of the Epson Workforce WF-2630WF	printer? A. This printer can print up to 9 colour pages per minute and up to 4.7 black and white pages per minute. Q. Will it be possible for you to deliver Epson Workforce WF-2630WF ink cartridges to me in Belfast? A. Yes, we can deliver Epson Workforce WF-2630WF ink cartridges to you in Belfast. We deliver to all areas of the Republic of Ireland and Northern Ireland. Q. Is it possible to get the compatible Epson Workforce WF-2630WF ink cartridges provided on your site refilled? Do you provide the service of refilling cartridges? A. Yes, you can choose to refill our compatible Epson Workforce WF-2630WF ink cartridges once they are empty. However, Brother recommends that you do not refill the ink cartridges provided with your unit. You also need to keep in mind that a refilled cartridge may produce inferior print quality and reliability. We do not provide the facility of refilling ink cartridges. Q. Dark and white lines are appearing in my printouts. What can I do to solve this problem with my Epson Workforce WF-2630WF printer? You can try running a nozzle check to see if any of the print head nozzles are clogged. Then clean the print head, if necessary. You need to make sure that the paper type setting matches the type of paper that you have loaded. Check if you have loaded the printable side of the paper correctly. Turning off high-speed settings might solve this problem. If the above solutions do not solve the problem, you may need to replace the ink cartridges inside your printer.